Update: Swapped the rear Walbro 255 feed pump for a Aeromotive 340 after finding the main -44 was seeing suction at max flow. With the added fueling it allowed us to make a bit more power safely. Still this is about 3/4 of target boost! No need for more now. Will have plenty, just need to sort the cage and swap an axle before test and tune Friday.. Then maybe off to KCIR Sunday for the IFO race. PS not to give it away but that peak um, plateau is 700whp. So this new 6262 is pretty mean. Spent the afternoon getting the staged 630/1000 injectors sorted. Nira is a bit crude in that respect. Starts and idles on the 630s then at3k brings in the secondary. All works. Need some more sorting on the spoolup side. Nice power for just the wastegate spring. Looks like the fuel supply is lacking somewhere. Upper 80% already. With 4bar base we are over 1800cc/cyl. Have to address that before throwing more boost in up top. Won’t go over the current peak torque though. The underdrive alt pulley cured the electrical and belt gremlins. Now this is still a stock t5 head and manifold. Just clearanced for the cams. Man has ports added for the secondaries mounted at the top of the runners. Hoping our gains from the mild intake and big ports proven on my N/A project. 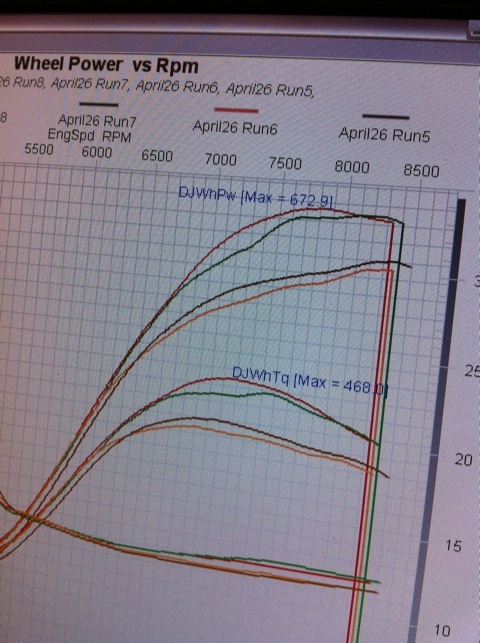 This entry was posted on Tuesday, April 26th, 2011 at 8.28 pm and is filed under Drag 2.0L NG900, Dyno. You can follow any responses to this entry through the RSS 2.0 feed. You can leave a response, or trackback from your own site.